"Absolutely delicious! I have made these in a skillet as well and they taste just as delicious as on the grill. I prefer to use fresh crabmeat, but you can use whatever is on hand." Drain the crabmeat. In a large bowl, mix the crabmeat, bread crumbs, mayonnaise, egg, green onions, hot sauce, and salt and pepper until combined. Shape the mixture into 16 small cakes. Refrigerate for 30 minutes. Meanwhile, in a small bowl combine the diced mango, onion, basil, cilantro, lime juice, jalapeno (if using), and salt and pepper. Refrigerate until ready to use. To grill: Preheat grill for medium heat and lightly oil the grate or a grill basket. Grill about 8 minutes, turning once. To pan-fry: Heat 2 tablespoons vegetable oil in a large skillet over medium heat. Cook crab cake patties until crisp and golden brown on both sides, about 4 minutes per side. 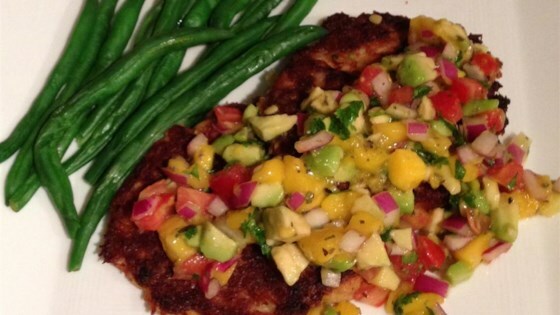 Top crab cakes with mango salsa and enjoy. These crab cakes are simple to make, but rich and memorable. I never understand crab cake recipes. Including this recipe (followed exactly as above except 1 less onion), the cakes always fall apart completely while cooking. It was good. We thought there was way too much onion(I got one of the smaller ones in the store). absolutely amazing!! I used ranch instead of mayo and panko breadcrumbs for lots of flavor. they held together great and still came out fluffy.